The multiplier estimates above are from new research by Ethan Ilzetzki, Enrique G. Mendoza, and Carlos A. Vegh. 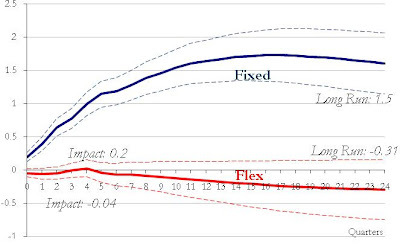 They imply that the effects of fiscal policy depend crucially on whether the exchange rate is fixed or floating (flex), precisely as predicted by the Mundell-Fleming model. Don't remember Mundell-Fleming? For a review, see my favorite intermediate macro textbook.